This post is a paid collaboration with Lowe’s Home Improvement. All opinions are my own. 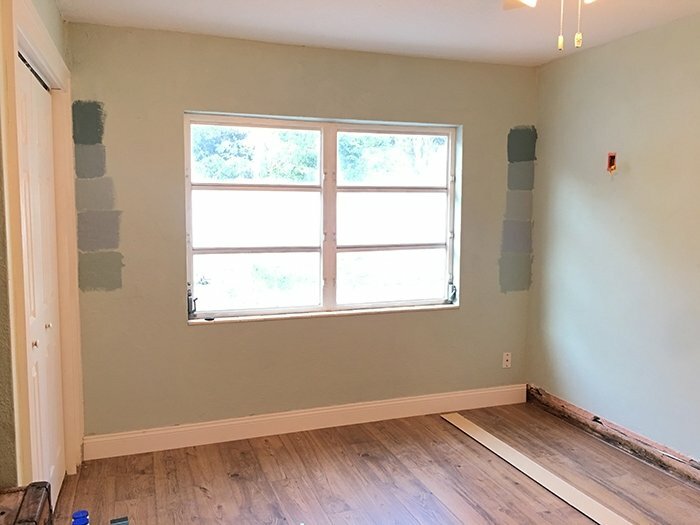 Introducing our next project in the Riverside Retreat… the guest bedroom! After years of trial and error, there’s a certain strategy I like to follow that seems to be the most successful. 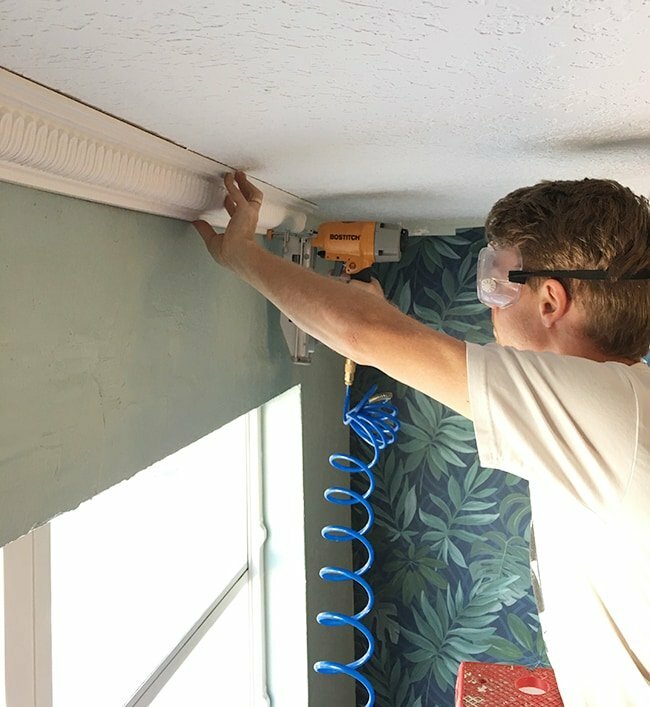 It’s the same process for every room whether it’s a bedroom, kitchen or even outdoor space, and it’s becoming second nature with more practice. 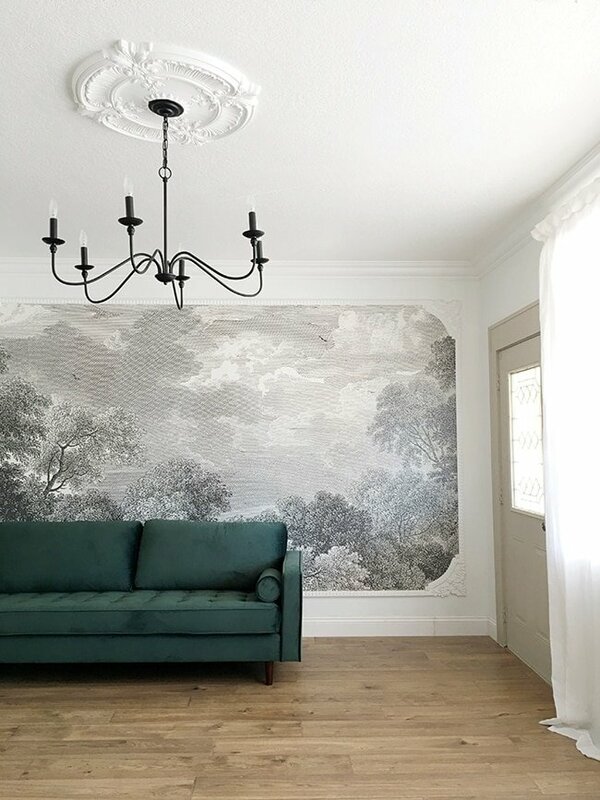 Today I’m going to walk you through Phase 1 of this design process, which focuses on the large surfaces—walls, floors, ceiling and architectural details. These are all very important components as they visually make up the largest part of the design, and should be well thought out in the planning stages. It all starts with a single piece of inspiration—this can be anything from a color to a pattern, a piece of furniture, textile, fixture, etc. Fall in love with something and use that as the foundation to build your design. Let it be your guide to envision how you want the space to feel when you walk inside. Focus on the feeling first, and the design will follow. Can’t you just hear the birds chirping and monkeys howling? Maybe I should hide a speaker in there that plays jungle noises full time. Hmmm… now that would be an experience! But before we get too ahead of ourselves and talk about the furniture + accessories (Phase 2), we need to focus on the foundation of the room. 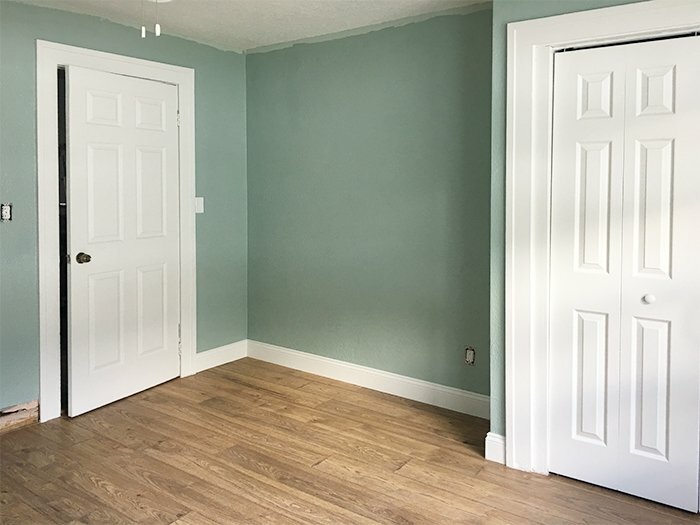 You may remember that we had Pergo laminate installed last month, so the ‘flooring’ portion of Phase 1 was already taken care of. Warm wood floors go beautifully with pretty much any design, and it’ll give the space an earthy grounded element. 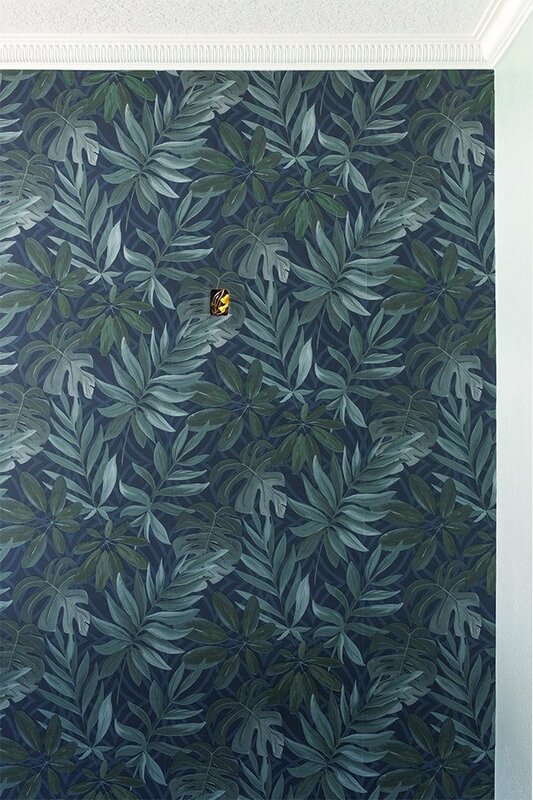 Since this wallpaper is so bold, I decided to use it on just one wall as to not overwhelm the small room. The focal wall of any bedroom is where the headboards will go, so it made the most sense to direct the attention there. I wasn’t quite sure if I wanted a blue or green tone, so I selected 5 different shades in a range of tones. I’ve preached this before and I’ll keep on preachin’ it forever—always get paint samples! 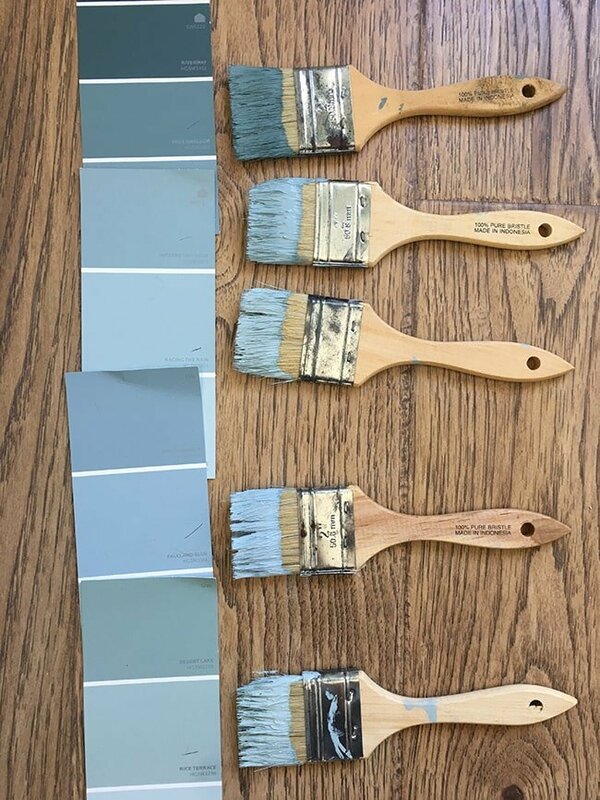 It’s crazy how different those swatches look not only in the store, but on different walls in your home and at different times of day. Here’s the same shot with the light turned on. See how different the colors look? Same time of day, different wall. The colors even look different just a few feet away. 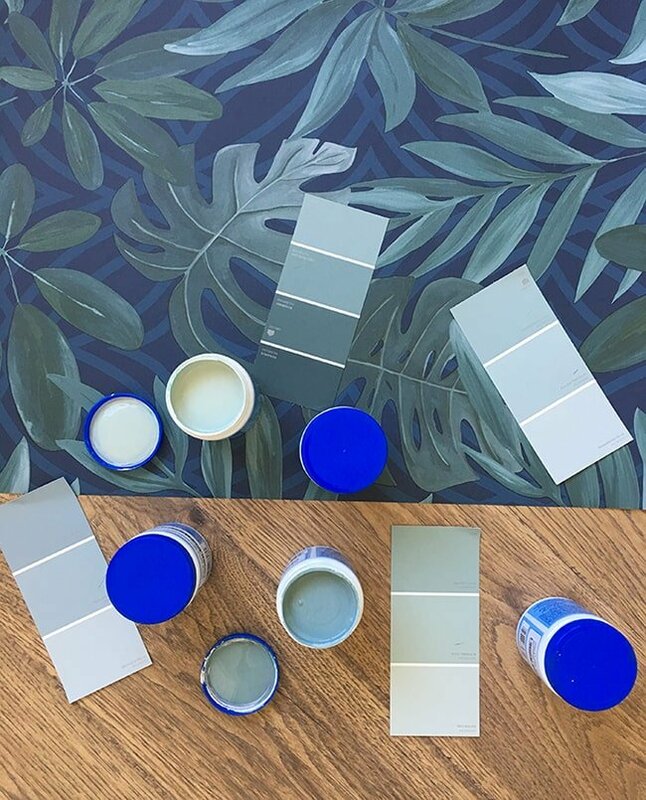 This just proves that there is no one “right paint color”—many shades can work, because they’re all constantly changing anyway! 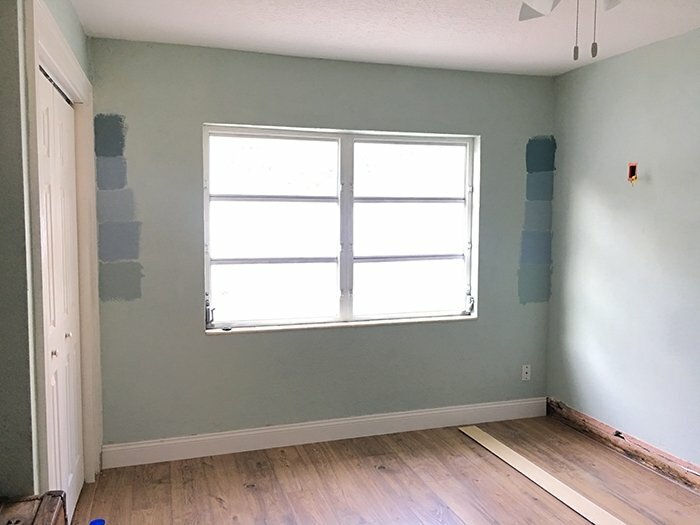 After getting the swatches on the wall, my bluest options looked purple so those were out. It was a tough call between the other three, but in the end, Rice Terrace (the bottom shade) won out. 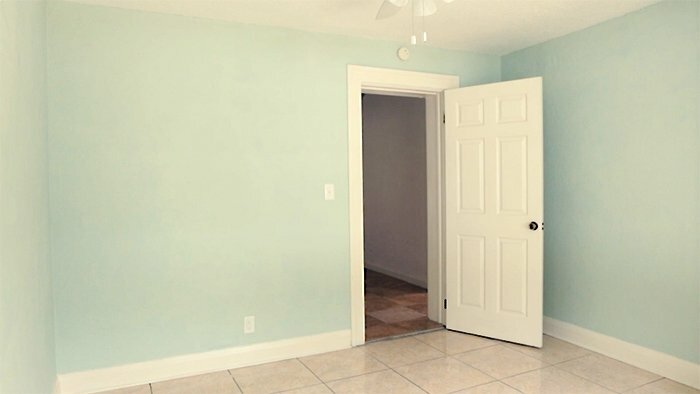 The swatch looked green in the store, but in this room it ranges from light to mid-toned, teal to turquoise. 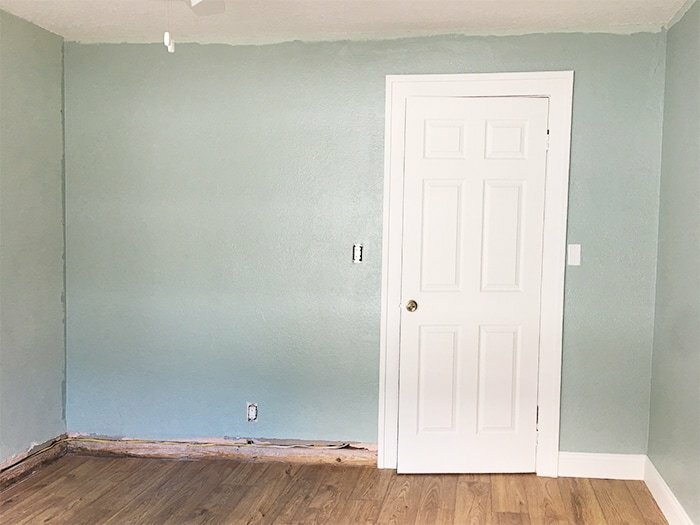 I tried out Sherwin Williams higher end ‘Infinity‘ line, and it covered in a single coat. 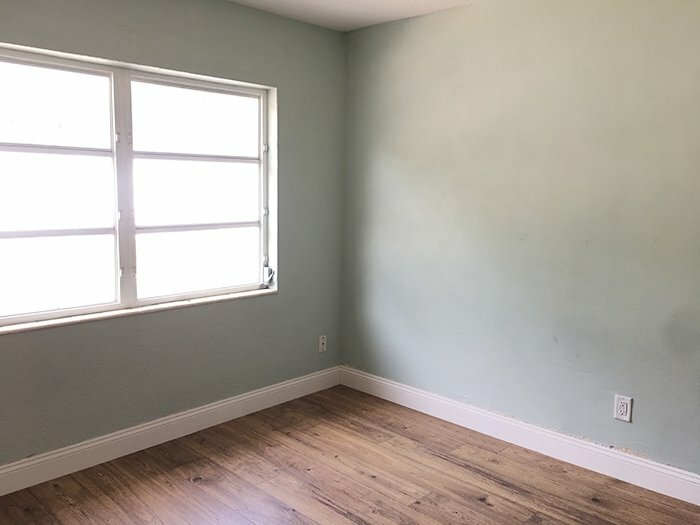 I opted for an eggshell finish, only because kids rooms tend to be considered ‘high traffic’ with a higher potential of destruction, and this paint is scrubbable so I won’t have to worry about repainting! As a future vacation rental, durability and longevity is top priority. 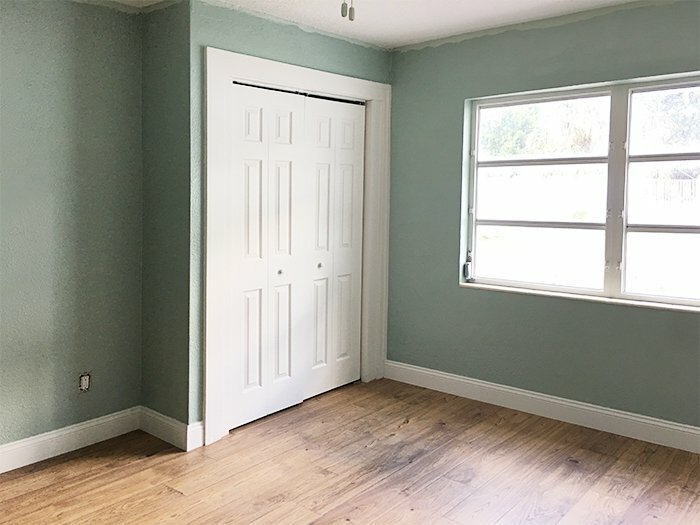 I also repainted all of the trim & doors in HGTV Home by SW Pure White to match the rest of the house (also in an eggshell finish because it’s what I had at hand, but satin or semi-gloss is a better choice FYI). I went for an extra crisp white to balance out all of the dark tones and give the room that nice clean contrast. 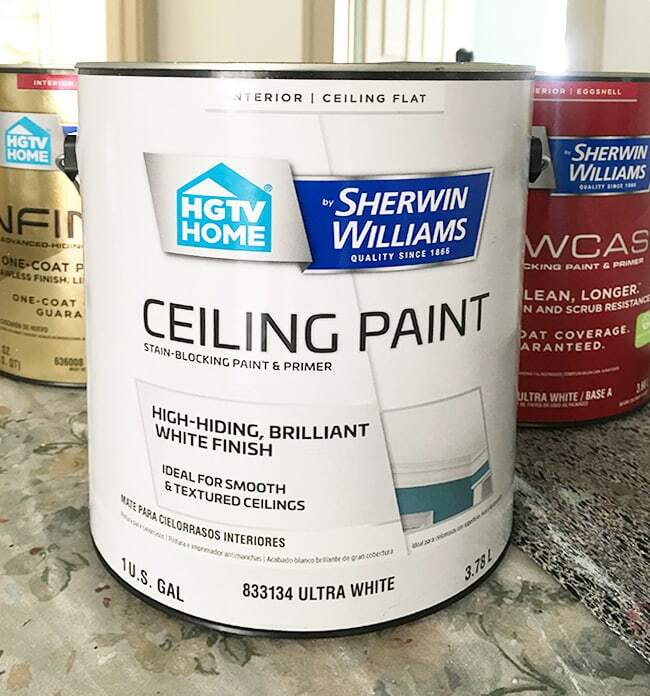 One product I recently discovered is ceiling paint—have you heard of this? 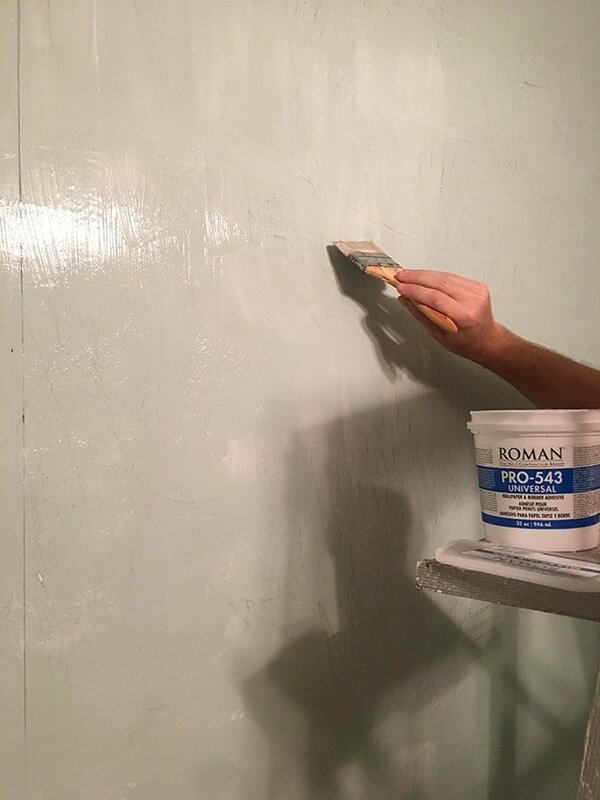 It’s a specially formulated paint that is spatter resistant, blocks stains and comes in a matte finish, which is ideal especially for textured ceilings like ours. We had a few stains and this covered right over them. 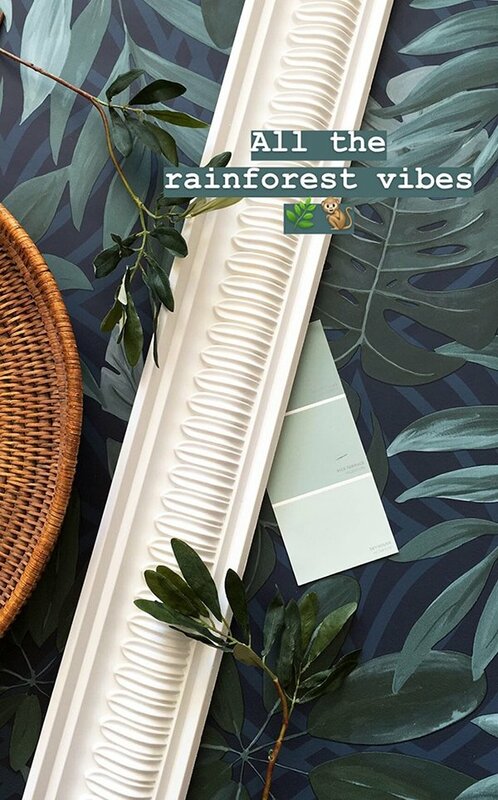 I plan to use this for all of the white ceilings in the house—it’s nice to have consistency and not worry about choosing the right shade of white and proper sheen. 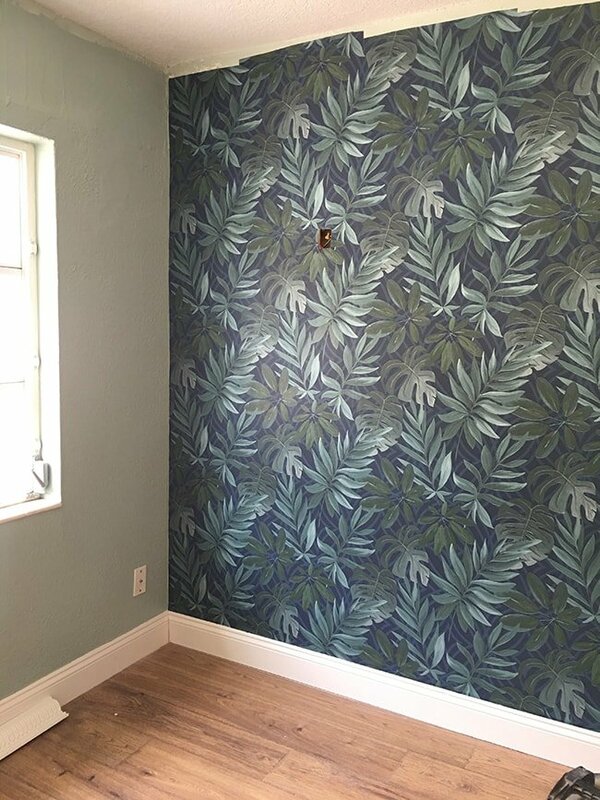 With all the painting done, it was time to install our wallpaper! We used Brewster paper in our laundry room makeover so we were familiar with it and knew what to expect. 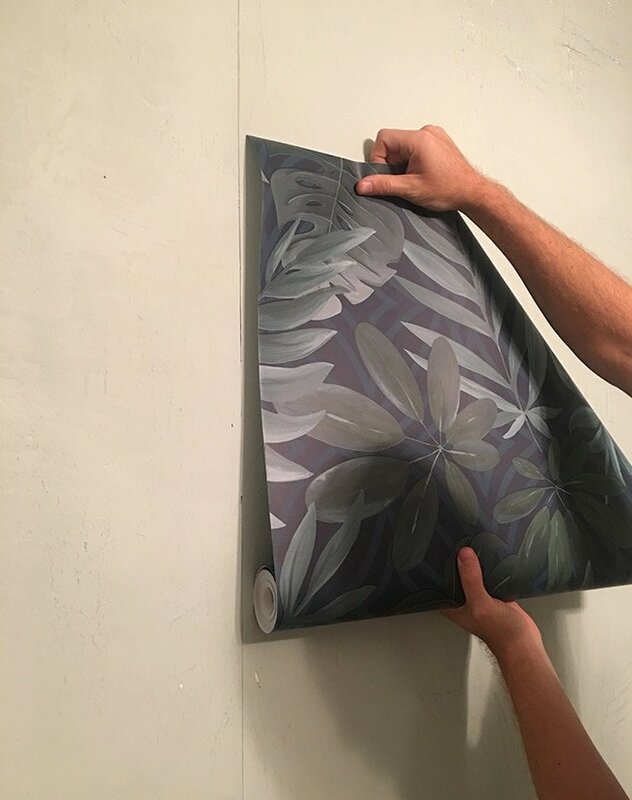 It’s thinner than pre-pasted paper (at least the mural we used in our living room) which makes it a lot easier to cut, and it’s less messy because you can control how much adhesive is used. 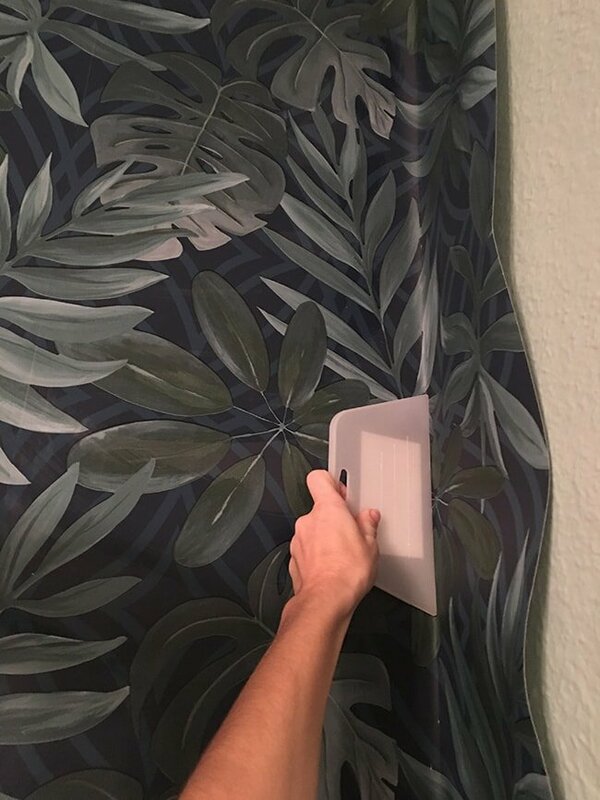 Tip: the more you use, the more easily you can slide the paper into place—so use a lot! You can always sponge off the excess, but it’s hard to glue the edges back down after everything has dried. 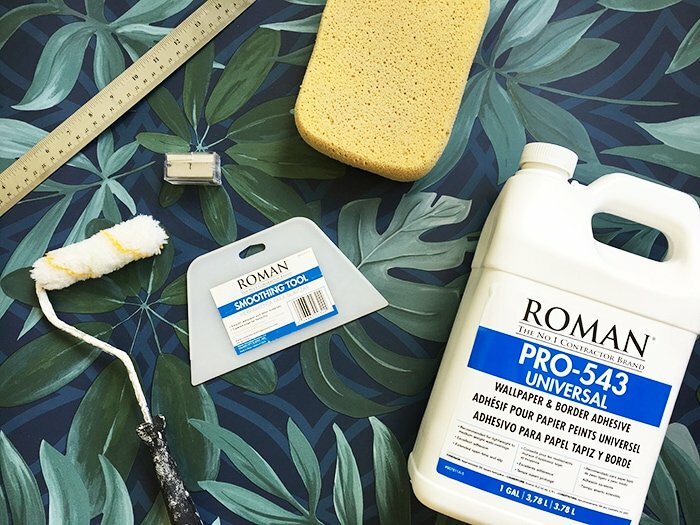 I’ve found that Roman adhesive is easy to work with and gets the job done. We started our first panel in the center of the wall, drawing a straight line with a laser level and working our way out from there. 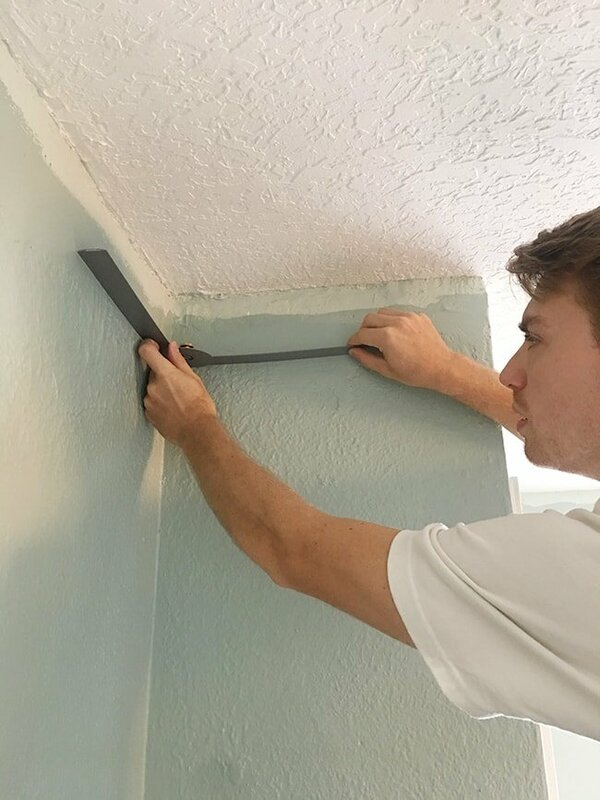 We knew we’d have to trim the paper along the edges of the wall no matter what, so we calculated an ideal starting point that left us with around 10″ of paper to trim on each edge. 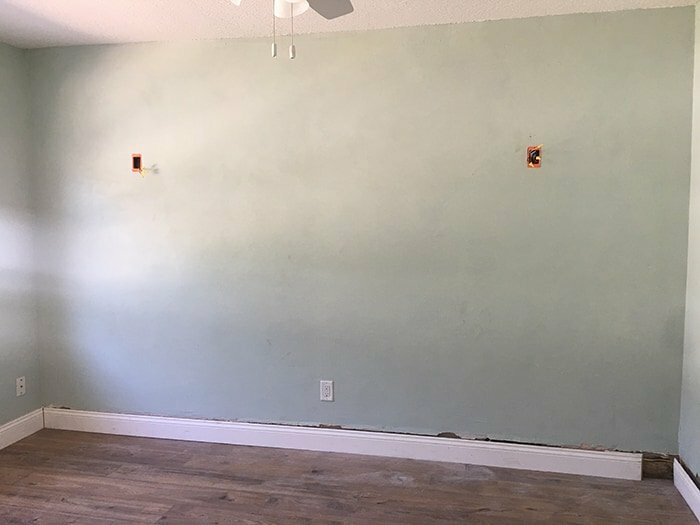 Fortunately, we didn’t have to worry about making straight cuts at the top and bottom since we’d be covering that up with baseboard & crown. 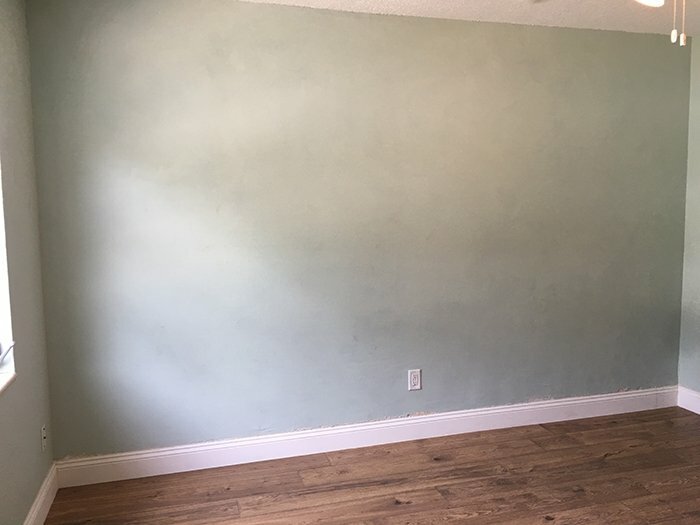 Oh, and I should mention we got lucky because this is the only wall in the room that was (relatively) smooth—all the others were highly textured. 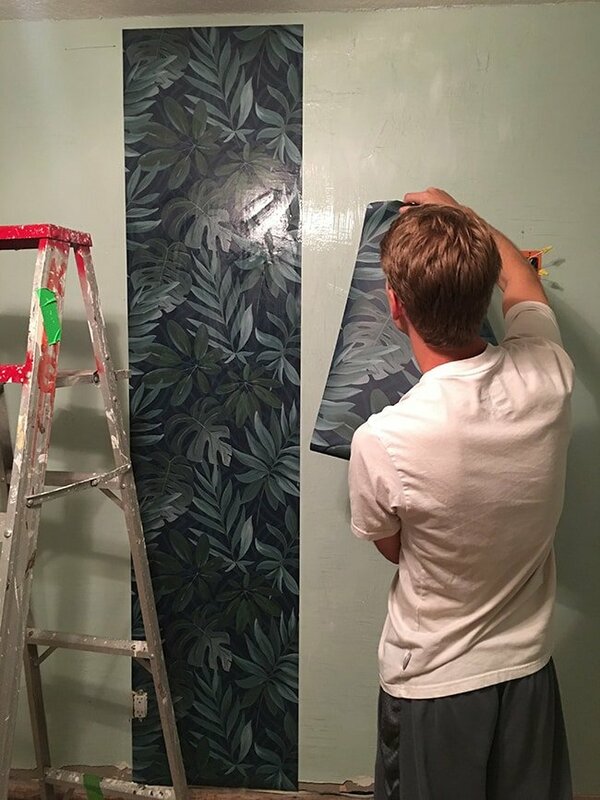 We would have had to either cover the wall or skim coat it before installing the paper, since you’d be able to see the texture underneath. Whew, one less project! Oooh yeah… look at that dimension! Can you start to see my vision yet? 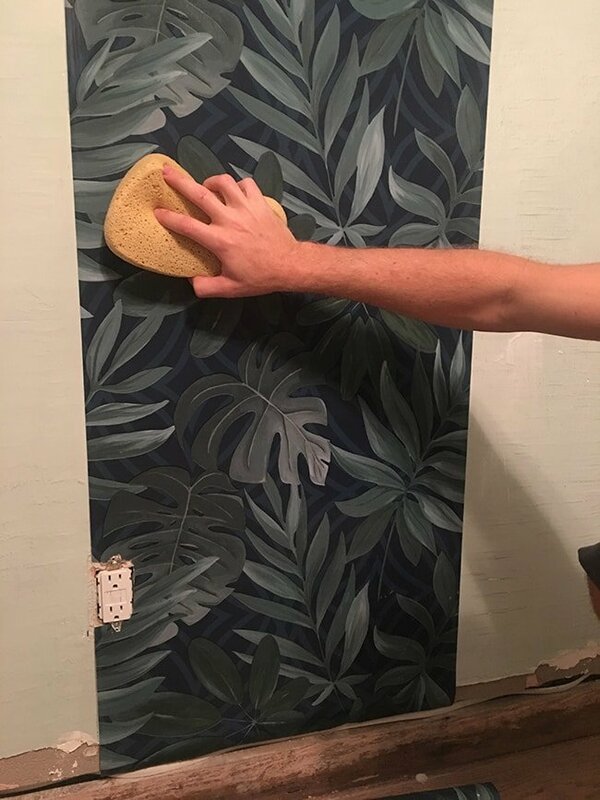 🙌 It took us one evening (maybe 3-4 hours) to finish the wall, and to trim at the wall edges we used a straight edge and a sharp utility knife. It turned out quite decent considering the bumpy walls made the corners uneven. 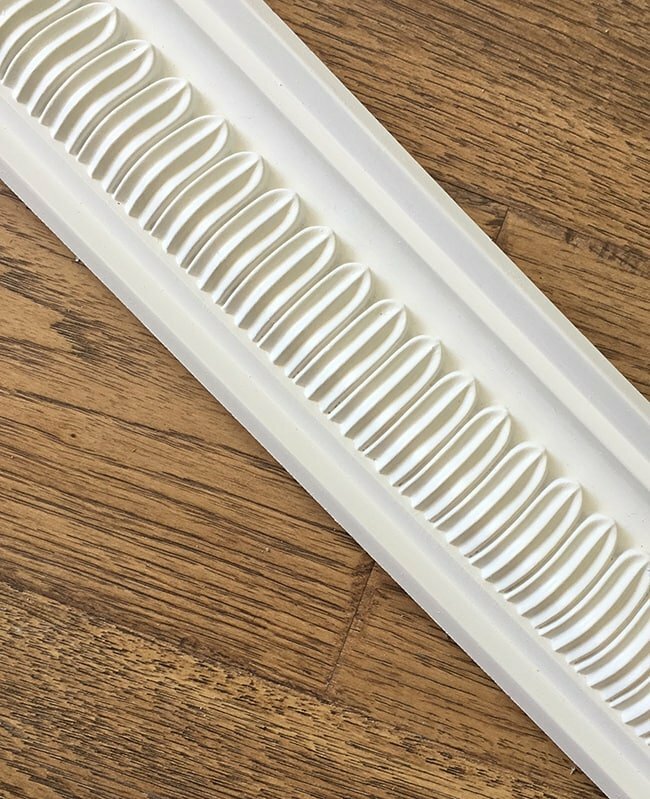 I think of trim and molding as a necessary design element to make any room feel polished and complete. It’s like dotting your i’s and crossing your t’s. Bonus points if it has pretty detailing! 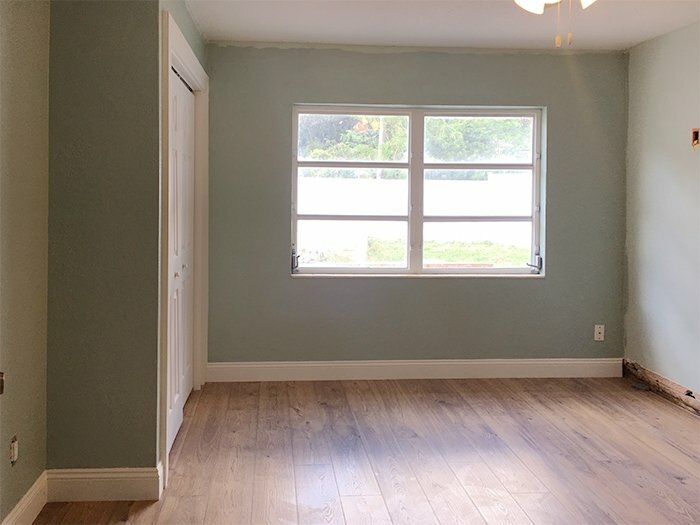 We already had new baseboard installed with our new floors, so now it was time to choose crown molding. 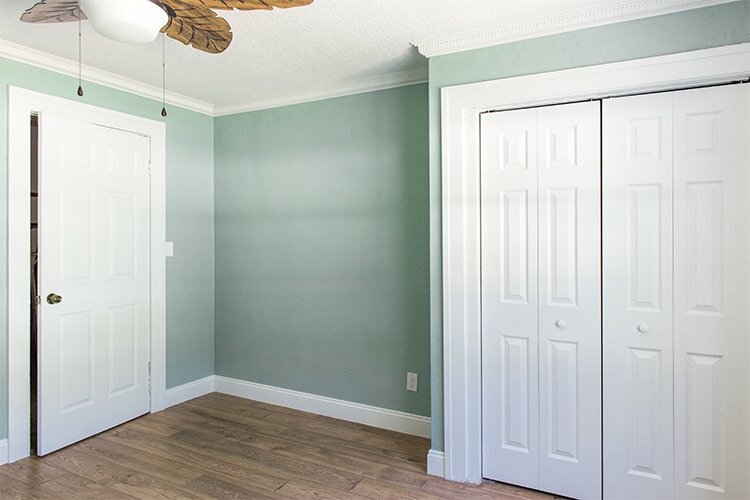 I could have picked out any average crown molding, but I thought why not use this as an opportunity to do something unexpected? 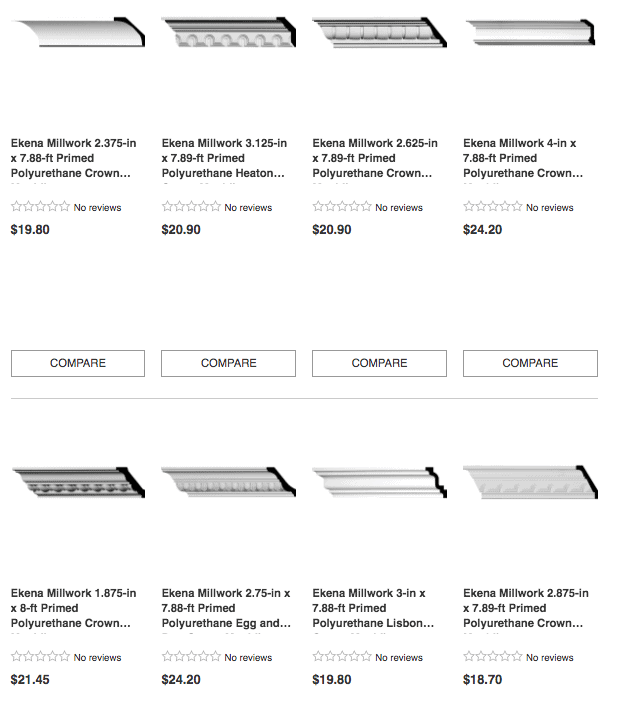 Ahh browsing for crown, I’ll take that over clothes shopping any day! Who’s with me? 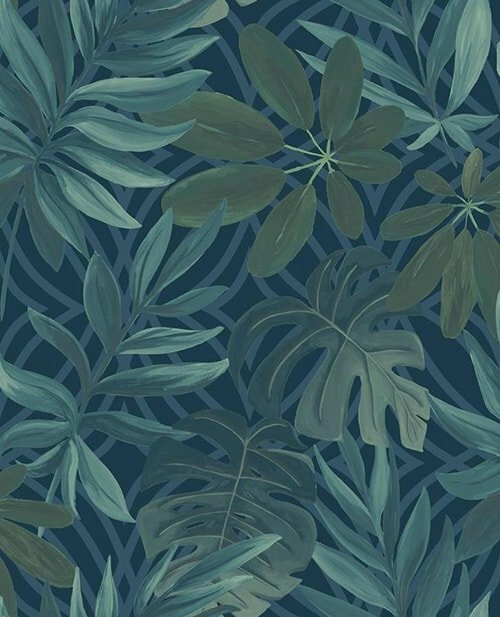 Doesn’t it remind you of leaves? That’s what I immediately thought of—it was meant to be. 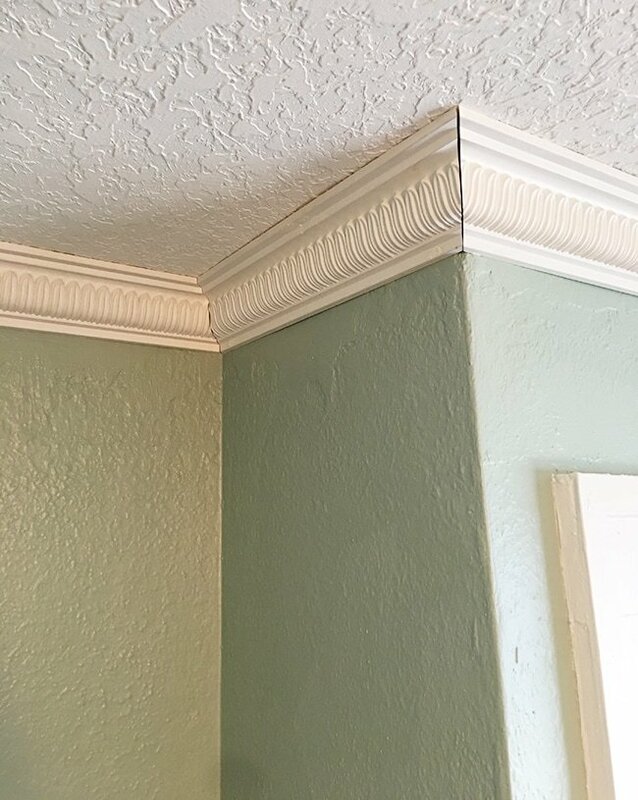 This is the same manufacturer and lightweight poly molding we used for our living room crown, and we chose it again because it’s the easiest to work with. 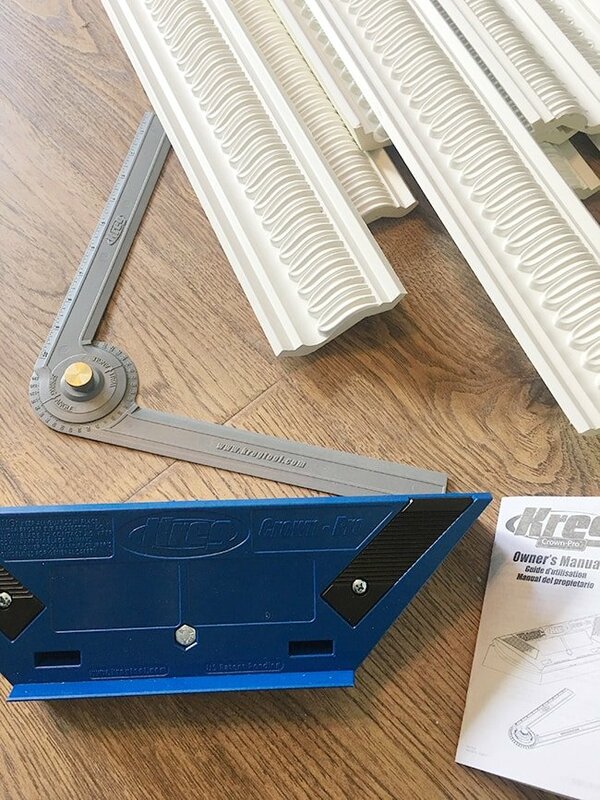 This time around I also ordered the Kreg crown guide after our contractor friend swore by it. Couldn’t hurt to try it! Almost all of our cuts fit together quite nicely (unlike our first living room attempt) and the great thing about this foam-like molding is that it has some flex to it, so it was forgiving with our highly uneven walls. Not too bad, right? 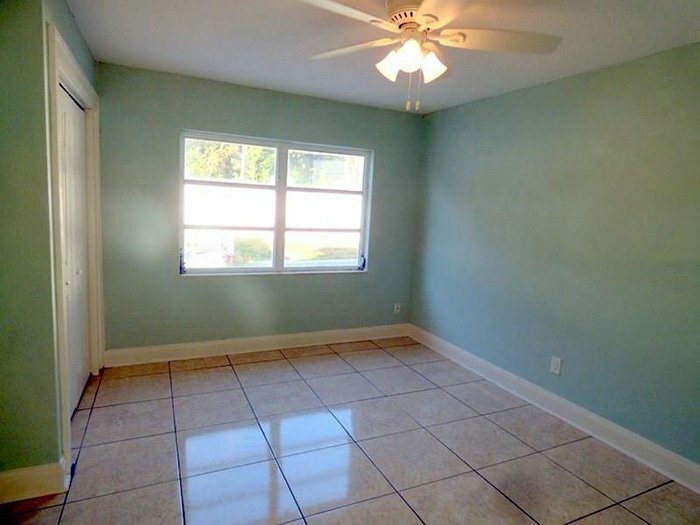 Spackle and caulk made all those gaps disappear. 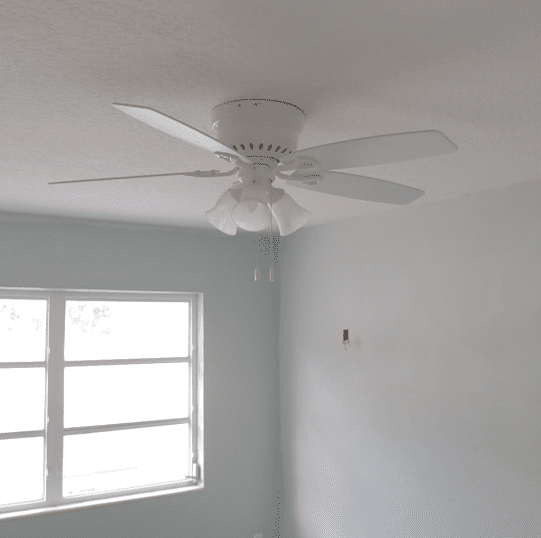 Let’s be honest, ceiling fans aren’t exactly the most exciting or beautiful thing in a room and I prefer to look at a chandelier, however, this is Florida, and sometimes you just need a little airflow in the bedroom. 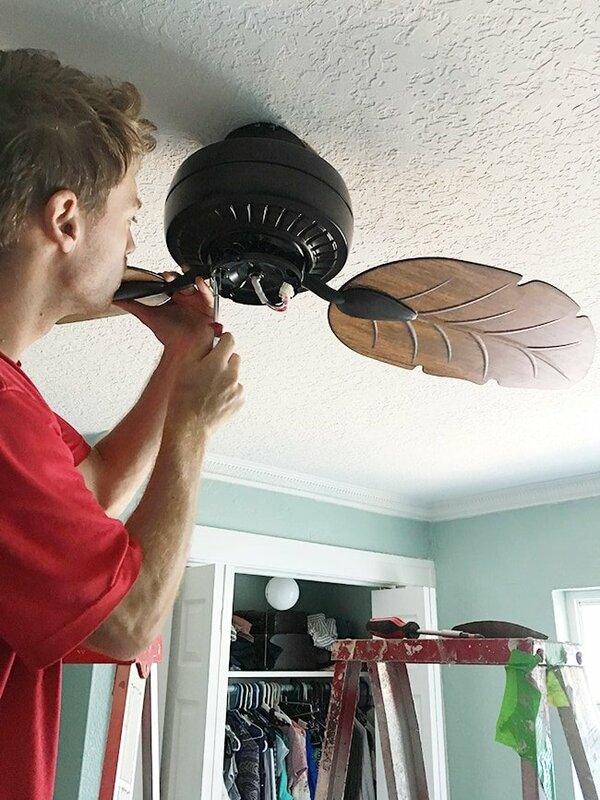 Since we’ll have guests sleeping here, comfort comes first, so a ceiling fan it is! 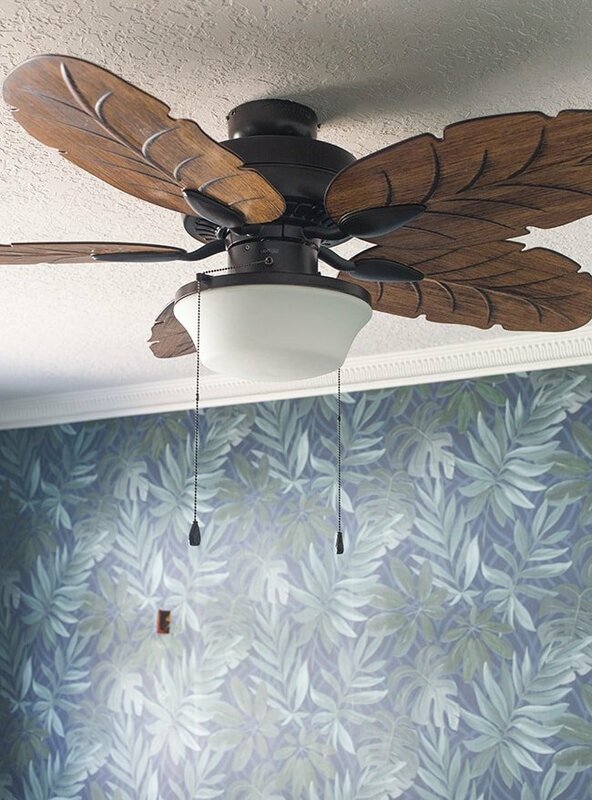 I figured I may as well make it a design feature rather than try to camouflage it, and I knew I had found my dream fan the moment I saw it in Lowe’s. And this crown… I just can’t get enough. Never underestimate the power of molding, my friends. 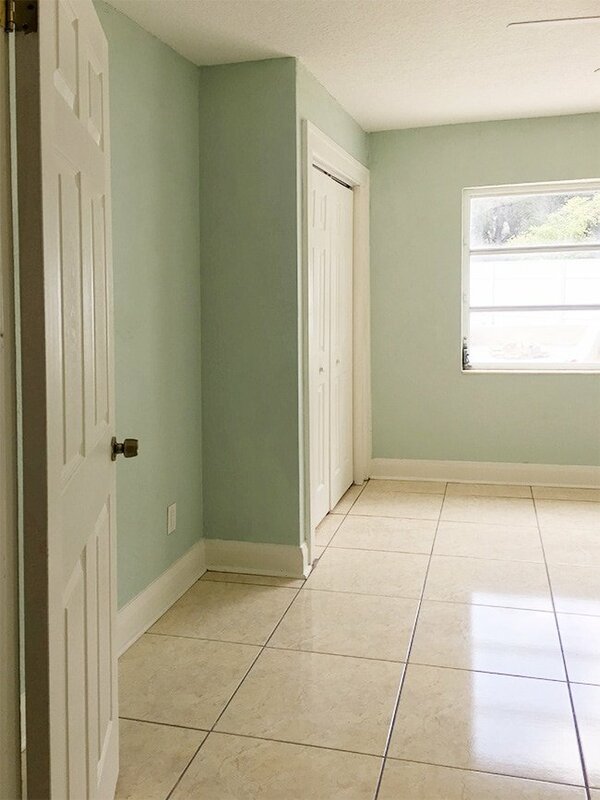 Are you as excited as I am to see Phase 2 of this room design? 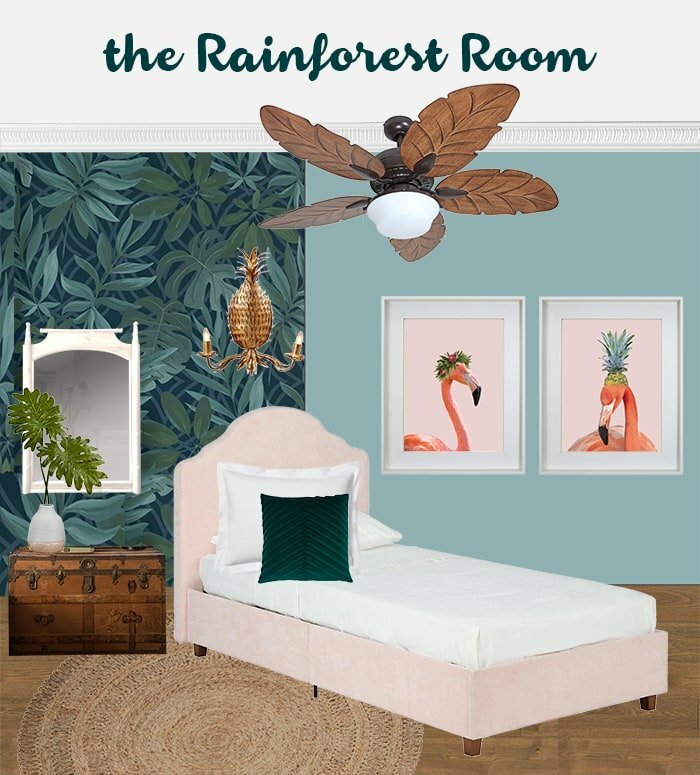 Bring on the pink velvet, gold pineapple sconces and flamingos! Shipments have already started to arrive and I’ll be sharing them as they come in over on my Instagram stories! Make sure you’re following me there, because we’re juggling multiple projects and they’re all moving faster than I can keep up with. Lots of exciting progress is being made and you won’t want to miss a single post! I always look forward to your Wednesday updates and love this bedroom for children! Can’t wait to see it all pulled together! Beautiful as always. Completely on board with the design plan! It’s going to look great. 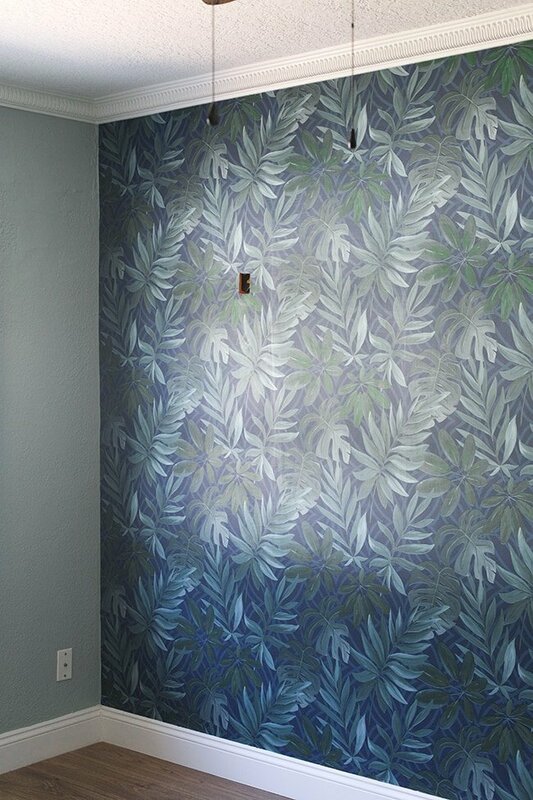 Dying over the paper and sconces but perhaps a bit much for every day. 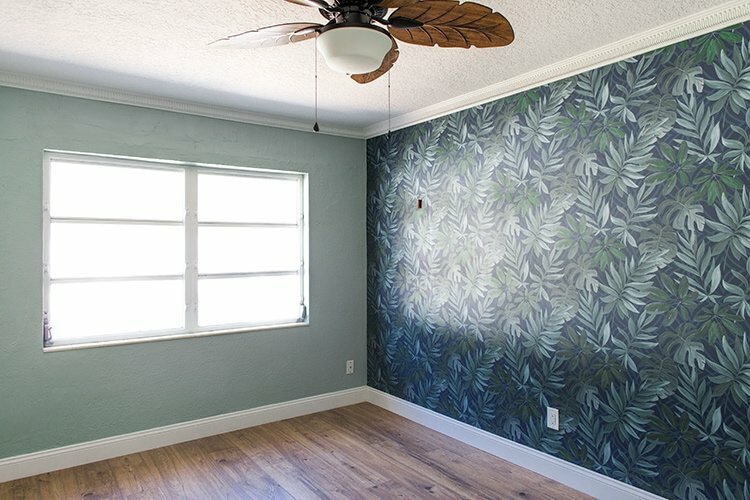 Yes, this design is too bold for our next house, so I’m enjoying it now while I can! I used the word foam because that’s what it feels like, but it is technically polyurethane. Not sure about the fire ratings — you would think they’d have to pass some sort of testing in order to be sold? Either way, we have plaster walls which are a fire deterrent! 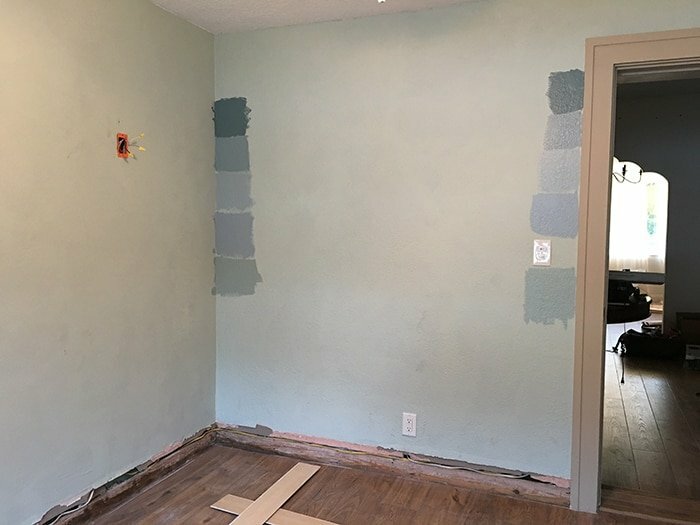 Hey Jenna, I’ve been a long time follower and am wondering if there’s a reason you switched to SW paint? 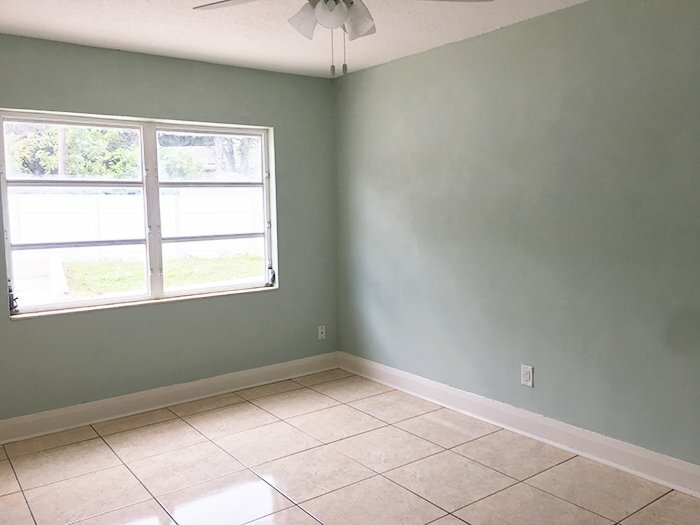 I know in the past you used to favor Valspar – and with that in mind, that’s the primary brand we used in our new house the other year. Just curious! (I know it’s a sponsored post but Lowes carries Valspar so I wasn’t sure if there was more to it.) Thanks! This is AMAZING!! Gives me inspiration for my small rooms. What software are you using to help you visualize your plan? That’s my biggest problem- I can’t see the whole picture and it makes me scared to make a move or the next move. Oh my gosh, so pretty and such a helpful post! Thank You! Just wondering what software you use to pull the design board together? Looks beautiful! Thanks for the super helpful post! Just wondering what software you use to create your design board? Thanks! (Sorry if this comment came through twice). Just, wow! It’s already unrecognizable from the original. It’s super fun to watch the transformation. It’s kind of like seeing what someone else scored from the thrift store. This is gonna look soooo good in the rental photos!! 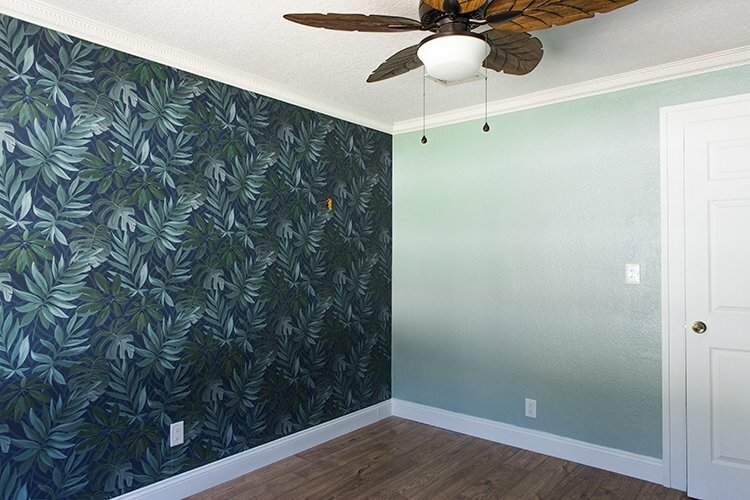 The room looks amazing, I was just wondering how the wallpaper sticks on textured walls?? 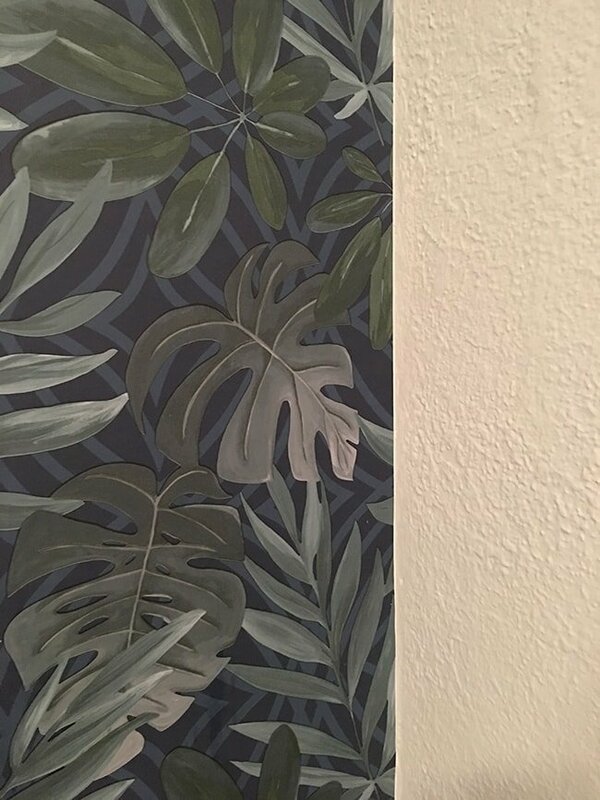 Im dying to put some in my kids rooms but worry about it not sticking correctly or looking lumping because of the texture?? Hi Adriana, this wall had very little texture! I mentioned it in the blog post, but it’s the only wall in the room without texture. 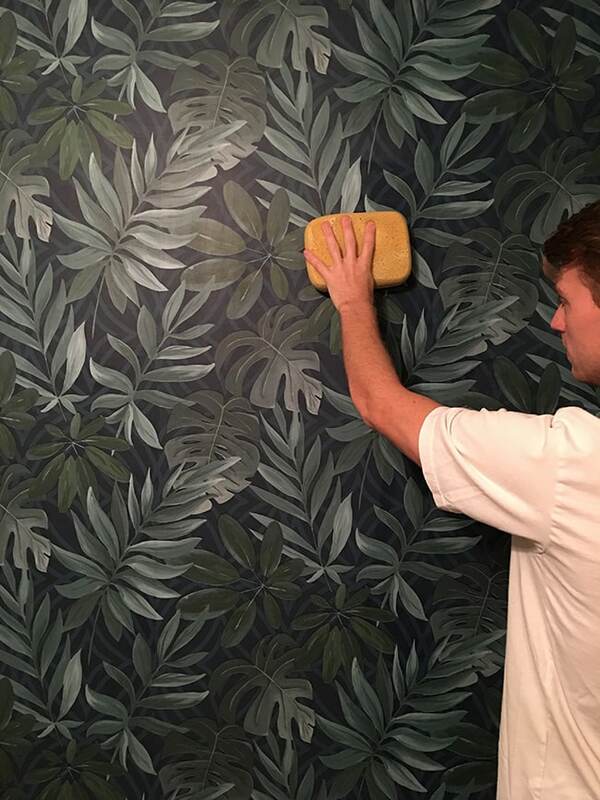 You’d have to skim coat or cover your current walls if they’re highly textured! Gorgeous! I am SO looking forward to the big reveal.